When it comes to learning management systems – or any learning technology solution – value for money is essential. It’s important today, more than ever, when every action and investment quickly starts to add up. In our new workbook, you’ll find out how to calculate your return on investment (ROI) and secure the training budget you deserve! Why do we Neglect Training Evaluation? Training evaluation is important – so why is it always seen as an afterthought? Evaluating your training could well be the secret to winning your next training budget. Donald Kirkpatrick, Roger Kaufman, Jack Phillips – what do these names all have in common? Is the Kirkpatrick Model Still Relevant? What do paradigm shifts in learning technologies mean for the old models of training evaluation? The GE Framework for training evaluation lets you use your learning technologies to their greatest potential! Once you’ve finished your evaluation, it’s time to work out what went well and what you can do better. If your ROI is looking a bit worse for wear, then you need to ask yourself a question: Are your learners engaged? To help you calculate your ROI, we’ve created a handy worksheet! We’re facing an evaluation crisis. Only 16% of training managers think they put enough effort into evaluation. To make matters worse, only 1 in 20 managers are measuring ROI. 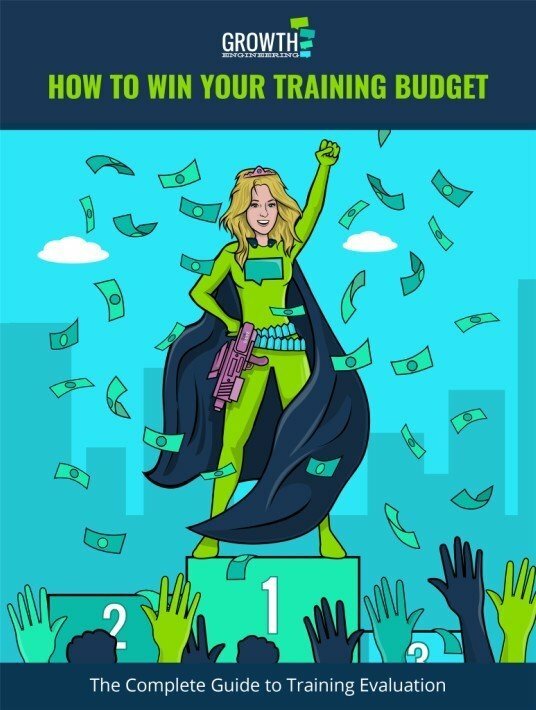 This step-by-step guidebook has been created to help you satisfactorily evaluate your training, so you can win the training budget you deserve! As L&D professionals, we spend so much time focusing on delivery that evaluation often gets overlooked. It’s time to right this wrong! If you’ve been looking for an easy way to calculate your training’s ROI, then this wonderful workbook, brought to you by my friends at Growth Engineering, is just for you.